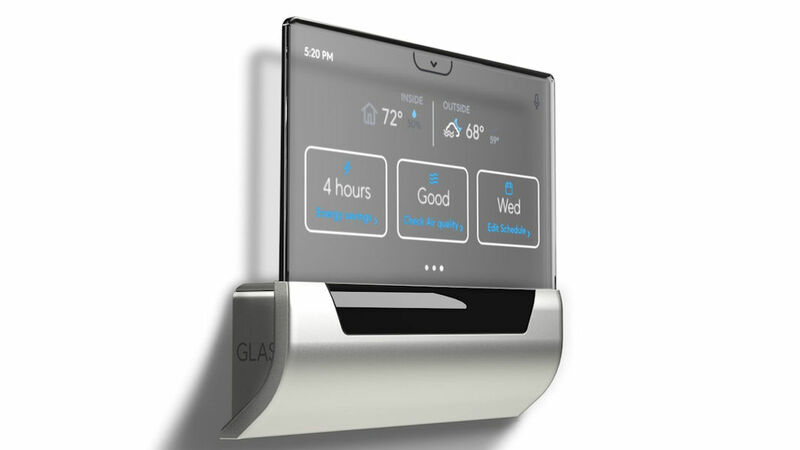 Most thermostats aren’t much to look at, but Johnson Controls and Microsoft have teamed up to build a beautiful smart thermostat called GLAS. This one will look great in your home. The device features a translucent touchscreen display. It was unveiled last year, but now it is ready for prime time. In fact, Microsoft has started taking pre-orders for GLAS. The translucent OLED touchscreen display controls the thermostat’s functions. It will change the temperature, monitor indoor and outdoor air quality, track energy savings, and more. It tracks and monitors several aspects of air quality to make sure that you are always comfortable,including volatile organic compounds and equivalent carbon dioxide inside your home. When connected to the internet, it will monitor tree, grass, and ragweed pollen count, air quality index, and ultraviolet index. So this will be great for allergy sufferers. That is a pretty impressive range of features to go with good looks. GLAS can be controlled using a mobile app or by voice commands using Cortana. It runs on Microsoft’s Windows 10 IoT Core operating system and is powered by a Qualcomm Snapdragon 410E embedded processor. Connectivity is Bluetooth and Wi-Fi. It supports almost all 24VAC heating and cooling systems. You can sign up for pre-orders at glas.johnsoncontrols.com. GLAS costs $319 when pre-orders go live in March of 2018. This thermostat should be a winner.